← A Birthday to Remember…. It is definitely all about who you know in life. Our lives are enriched in so many ways by interacting with others and sometimes an unexpected surprise comes along that turns a normal day into something to savour and remember. This happened to me last week when my new best friend, the rather charming mad scientist/alchemist from Wellington known as Roger Jorgensen popped into the factory for a visit. We met for the first time a couple of weeks ago when I was trying to find a local cognac of sufficient quality to use in a new salami I wanted to develop. Roger is the passion behind Jorgensen Distillery and makes a range of artisan spirits. Although he is a bit primitiv our common philosophy and enthusiasm for what we do made made it obvious that our products were well suited. I chose his 14 year old Sauvignac brandy to start with and we eagerly await the results of the trial batch. But I digress…. As he was leaving, Roger gave me a couple of fresh Kalahari Truffles that had been sent to him by a friend from Namibia. Not having planned anything for the Commander’s repast that evening I was immediately filled with the excitement that comes from an unexpected surprise. 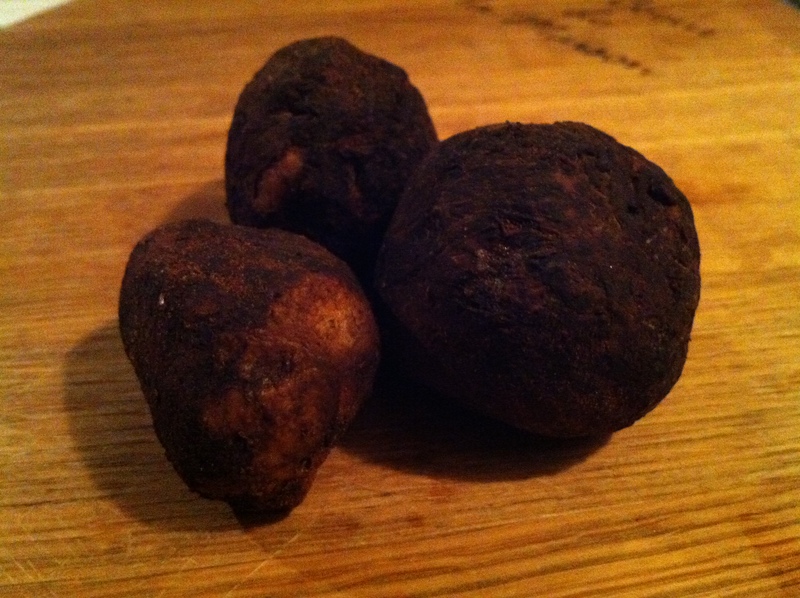 The truffles are about the size of a golf ball and have a very sandy outside that needs to be peeled away. Once peeled, I shaved them into thin slices and pan fried them in butter. They love butter, it complements the subtle flavour and enhances the nutty undertones. The dish is really simple (like me) and just requires your pasta of choice. I used tagliatelli but you can use linguini or even spaghetti. 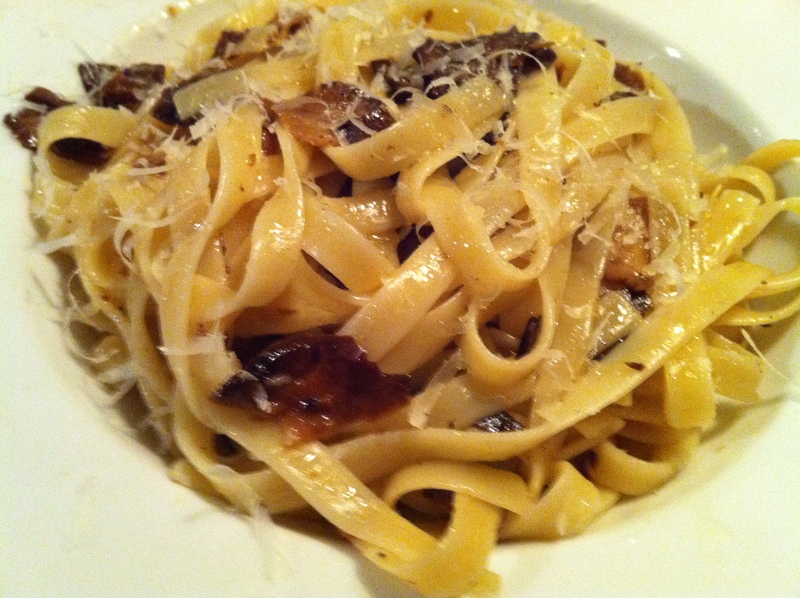 Toss the pasta in the pan with the truffles with a teaspoon of white truffle oil and serve topped with parmegiano. The truffles do not have a strong flavour and the white truffle oil is recommended. Salt and freshly ground black pepper are up to your discretion. The truffles are not easy to find unless you have a lot of Namibian friends but I have on occasion seen them at Melissas and The Old Biscuit Mill. I have one left in the fridge and will be inventing something tonight with fresh buffalo mozarella. 3 Responses to Kalahari Gold…….. Wonderful script and delicious-sounding recipe! Thanks Rich. We have been enjoying Kalahari Truffle omelettes, pastas, shaved raw over salad and tasty offerings added to ox tail stew. Maybe a truffle and boar sausage?……! And I feel a truffle and vodka cocktail coming on.